Animal Shelter Restaurant Month (April 2019) – Abandoned Animals Inc. In case you haven’t heard, Hamden Animal Control was formally asked to permanently vacate the North Haven Animal Shelter. In the lead-up to this May 1st deadline, Gimme Shelter will be having an Animal Shelter Restaurant Month during April. Ralph Santoro on solo acoustic guitar at The Playwright on Thursday, April 11th. Everything on this page came together in the 3 week period between the initial article on Friday, March 8th, and the March 28th deadline to this follow-up article. This is a testament to the community-minded merchants & musicians mentioned above, as well as the overall enthusiasm for this project. 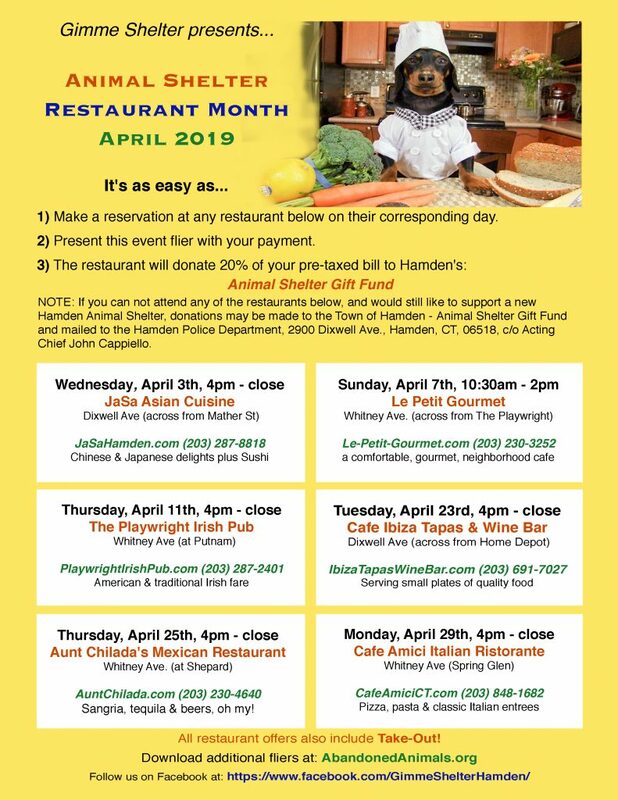 With the recent loss of the Hamden Post-Chronicle, we would appreciate if you would keep this momentum alive by sharing the details of our fundraiser.